When he was a child in Germany, most of the dinosaur books that University of Chicago paleontologist Nizar Ibrahim read didn’t mention Spinosaurus aegyptiacus, which means “spiny lizard from Egypt.” Even now, few do. But then the youth found a tome that introduced a story that hooked him for life: Between 1910 and 1914, Bavarian aristocrat Ernst Freiherr [Baron] Stromer von Reichenbach and fossil collector Richard Markgraf trekked through the eastern Sahara in Egypt, where among their finds were a few fossilized bones that appeared to belong to a previously unknown predator—one even larger than Tyrannosaurus rex. It was their exploits, Ibrahim says, that focused him on Africa. Now, thanks to Ibrahim’s digging in southeastern Morocco, Spinosaurus is poised to make its way into dino-lit, for kids and scholars alike. 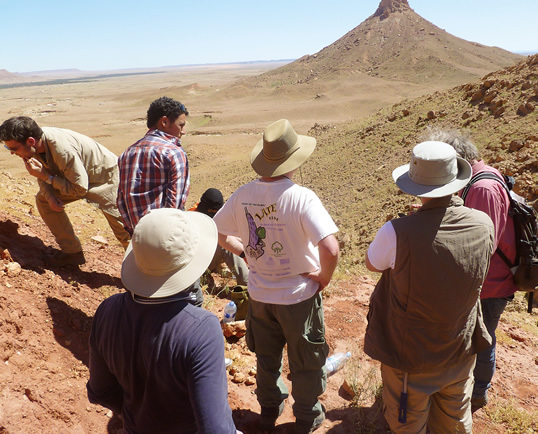 Paleontologist Nizar Ibrahim, far left, leads a team exploring the Kem Kem escarpment on the once-swampy edge of the Sahara Desert in southeastern Morocco, a region Ibrahim dubs “The River of Giants” for its treasures of fossilized bones of large dinosaurs. Largest among them, and adapted to both water and land, was Spinosaurus aegyptiacus. “I was perhaps six or seven at the time, and I still have all those books,” says the 32-year-old Berlin native whose bright blue eyes tip off his mixed German and Moroccan heritage. Ibrahim sated his curiosity at last several years ago amid the approximately 250-kilometer-long, fossil-rich Kem Kem escarpment, which lies on the Morocco-Algeria border in what was once a river system. It was there that he and his team uncovered more fossilized bones of a Spinosaurus, along with those of enormous flying reptiles such as Alanqa saharica and huge prehistoric fishes. The whole region, he says, was a largely unknown, 95-million-year-old Cretaceous ecosystem, a “lost world of African dinosaurs, a place far more bizarre than any other ecosystem we know about.” Fame in natural history circles came quickly, and last year The National Geographic Society dubbed Ibrahim “the dinosaur detective” and named him among its Emerging Explorers. The size of the carnivorous Spinosaurus tends to attract the most attention: At around 15 meters from nose to tail, it’s about the size of a school bus. That’s 20 percent longer than a T. rex—and taller, if it reared up. 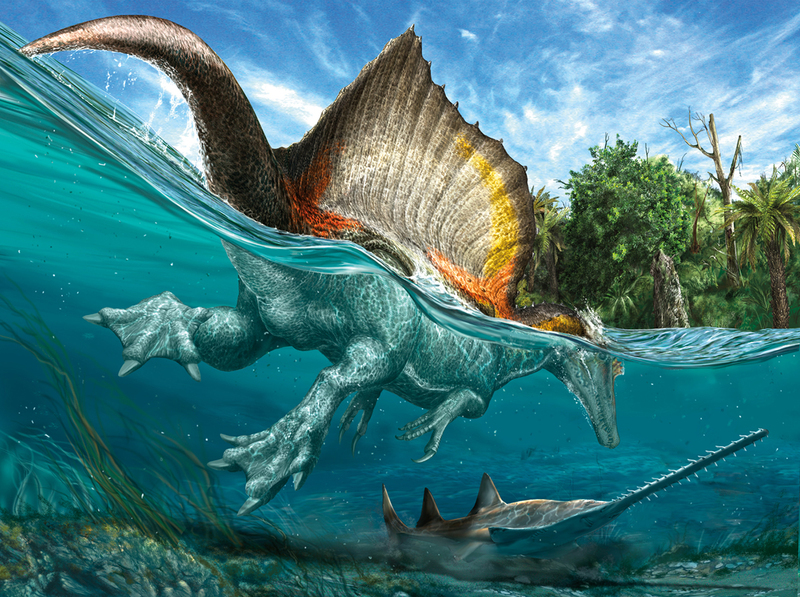 But Ibrahim says it’s the semi-aquatic adaptation of Spinosaurus that most fascinates him and other paleontologists. Ibrahim says Spinosaurus had slender, crocodile-like jaws more than 1.5 meters long with conical teeth that made them ideal for grabbing slippery fish. It also had a big, sail-like structure on its back supported by spines that were each taller than a human. Parts of a fossilized spine of a Spinosaurus are aligned next to an archeologist’s pick. Though Ibrahim’s search for the Spinosaurus began with childhood musings and models that led him to graduate school and research in Europe and North America as well as many trips to Morocco and the broader Sahara, his first real lead came in 2008 in Morocco. That was when he purchased some blade-shaped bones from a fossil hunter that he later thought might belong to a Spinosaurus. Italian colleagues later told him of fossils in Milan’s natural history museum. Ibrahim traveled to Italy to inspect the bones, which he learned had recently been acquired from an unidentified Moroccan fossil trader. When he compared his bones with the ones in Milan, he found that they matched. He wondered if they had come from the same reptile. In this sketch styled after Stromer’s skeletal reconstruction, Spinosaurus towers over a human. 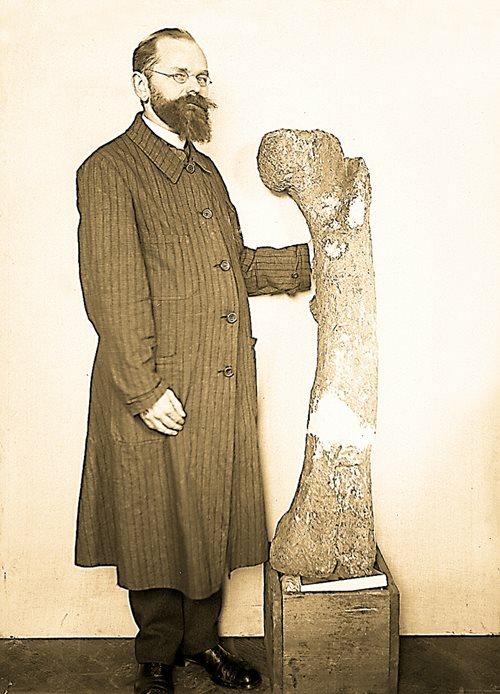 German paleontologist Ernst Freiherr [Baron] Stromer von Reichenbach posed with this fossil bone, attributed to a Bahariasaurus, after his expedition to Egypt in the early 1900s—when he also discovered the first fossilized remains of Spinosaurus. That was the beginning of the detective work. Ibrahim now had to locate the unnamed Moroccan fossil hunter from whom he’d bought his specimens in order to find the bones’ original location. All he remembered was that the man had a mustache. But back to Morocco he went, visiting village after village along the Sahara in search of the mystery man. In the oasis town of Erfoud, he was about to give up his quest when he saw a man walk by that he thought he recognized. He had a moustache. 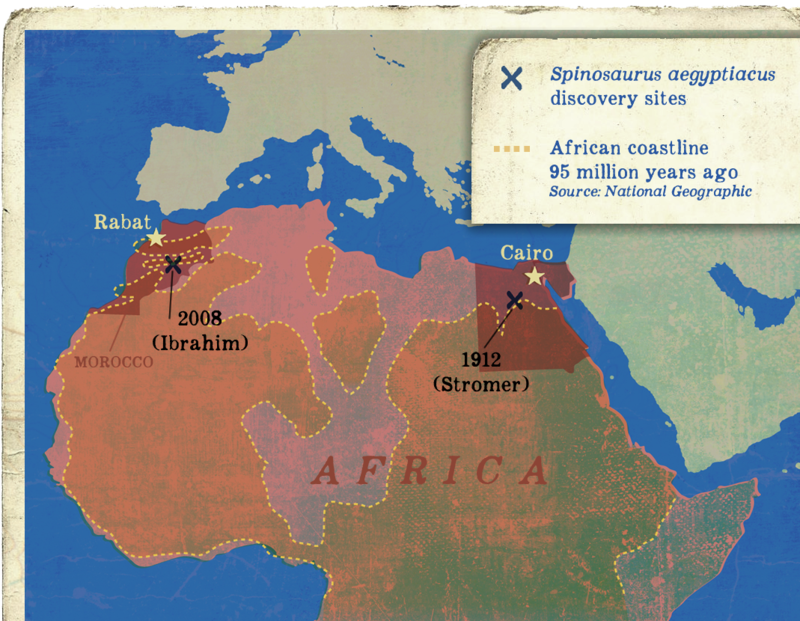 The pair talked, but the fossil digger balked at revealing the location of his find until Ibrahim convinced him of the discovery’s importance to Morocco. Then the man, who asked to remain anonymous, led the young paleontologist to a site not far from Erfoud. 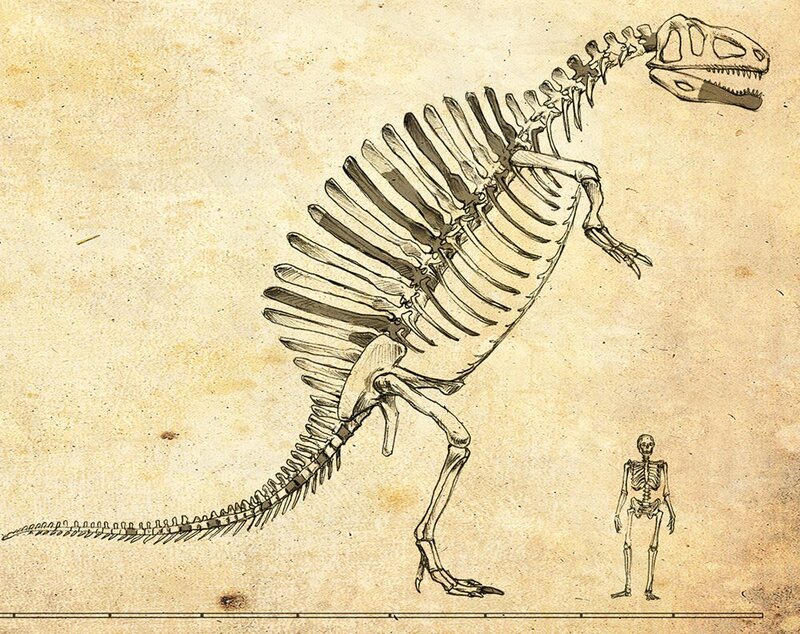 It yielded enough additional bones that with the help of technology and Stromer’s sketches, scientists at last built a skeleton of a Spinosaurus. Excavations continue, and today the displays they built are part of a traveling exhibition called “Spinosaurus: Lost Giant of the Cretaceous” that is now in Milan. The fossils Ibrahim discovered are back in Morocco as part of a research collection at Hassan iii University in Casablanca. If Ibrahim has his way, his Spinosaurus bones will one day become part of Morocco’s first natural-history museum. But first, he says, he needs to raise more interest in dinosaurs and paleontology in Morocco, the wider Maghrib and Middle East. He’s already working on educational programs to do just that. Not so in North Africa and the Middle East, he says. 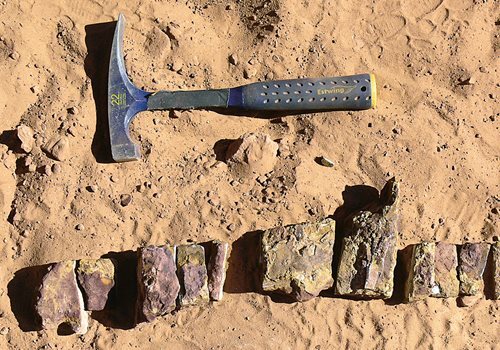 “People in Morocco are not aware that their country has yielded all these incredible fossils, and that Morocco has one of the most complete records of life on our planet. But when you tell kids there about dinosaurs and paleontology, they get excited and want to know a lot more. To me that’s very encouraging. Stromer, who in addition to being an explorer and a prolific writer was a professor at the Ludwig Maximilian University in Munich, would probably agree. A swimmer the size of a school bus armed with teeth and claws, Spinosaurus could weigh six to seven tons. Equally at home on land or in water, it was a predator without equal. If Ibrahim could meet his admitted role model, he says the first thing he would tell Stromer is that his theories about the first Spinosaurus fossils in Egypt were correct. Ibrahim shakes his head a bit when asked a pop-culture question: How would he handicap a battle between a Spinosaurus and a T. rex? But he replies patiently, knowing people are curious about such a match-up. 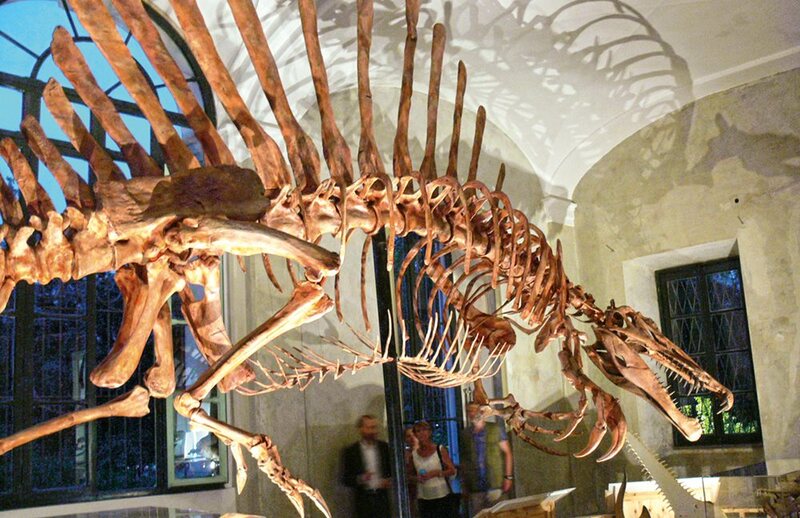 This life-size model of the dinosaur skeleton features in the traveling exhibition “Spinosaurus: Lost Giant of the Cretaceous,” now showing at the Pallazzo Dugnani in Milan. Then Ibrahim turns back to real science.“While some people seem to enjoy fight scenes between predatory dinosaurs in computer games and movies,” he says, “for me the most awe-inspiring and magical thing to watch would be to see these animals do what they are doing best, in their natural environment.